Functionality – Planning & orientation of rooms, openables to serve their very purpose with ease of movement of men and material. Natural Energy Resources – Planning to utilize the natural energy resources, i.e. Sun and air in optimum, thus to reduce & cut energy consumption bills. Vaastu compliance – Plans that integrate Vaastu ideology with modern era techniques. A Working Drawing gives micro-level dimensions of all the components of a house of all floors and serves as comprehensive guide for the construction of a structure. 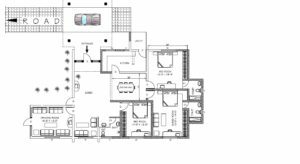 These drawings include detailed working plans, wall details, door and window details, section drawings, stair case details etc. Incorrect working drawings with vague specifications often lead to misunderstandings between owners and contractors. This results in increase in project cost and unsatisfactory results. Without perfect working drawing, it’s impossible to construct the design properly without any error. Working Drawings should be drawn with definite dimensions of all the components of the house such as staircases, doors, windows (along with their swing direction), galleries, thickness of walls, and arrangement of fixtures such as sinks, bathtubs and appliance. A Structural Drawing is a set of plans that shows how a building structure will be built. 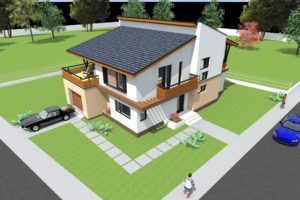 It includes foundation plan & dimensions, structural framing details, beam & column details, and wall sections which is used as a guide for building the structure. These drawings are prepared primarily concerning with the load-carrying members of a structure. They outline the size and types of materials to be used, as well as the general demands for connections. Structural Dead Loads, Live Loads, Wind and other loads, soil pressure and allowable stresses of materials used in the design. 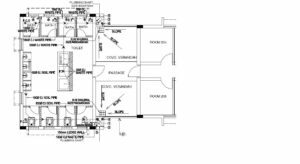 The Electrical Plan offers suggested locations with notes for all lighting, outlets, switches, and circuits. A layout is provided for each level. 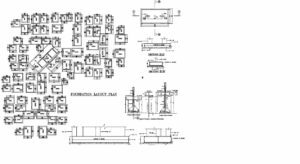 An Electrical Drawing is a layout of electrical wiring considering factors like load balancing, safety measures, and energy efficiency. It provides clear instructions and guidance to an electrician during the installation process. 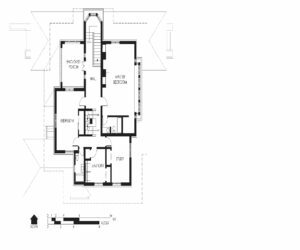 A plot plan showing interior and exterior wiring of the house. Electrical systems on every floor. Power-riser diagrams displaying panel boards. A Plumbing Drawing shows the water piping system of a house. A detailed plumbing drawing enables the plumber to spot a possible water flow issue that otherwise may get overlooked. A well designed plumbing systems ensures cost-effectiveness in a long run. Getting your plumbing system designed by an amateur might cause leakage, resulting in dampening of walls, which not only effects the beauty of your home but might also cause weakening of wall strength. A robust plumbing system remains effective and functioning throughout the year. ConcreteCivil provides you with cost-effective, easy-to-understand plumbing drawings for installation of the plumbing system. 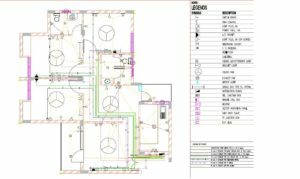 We create detailed Plumbing Drawings taking into consideration any future expansion that you might need. Our Plumbing Drawings give exhaustive details of water supply pipes, type of pipes to be used, fixtures and fixture traps, waste and vent pipes, rainwater drainage and sewer system. ConcreteCivil experts team provides high quality 3D images which lets you beforehand see the front and side perspective of your house. You can easily make changes in the model at a primitive stage which saves time, money, and effort at the time of construction. We provide readymade as well custom house designs from front and side perspectives. The model includes colors and texture for various external surfaces, shadows, reflections and spaces. 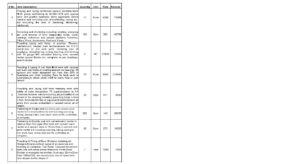 Bill of Quantity is a document which provides project specific requirement list with details of different project activities including their quantities, specifications & Unit of measurement. A Representative cost of Project is also determined considering prevailing market rates for all activities. A bifurcated quantity statement of different building materials, material costs, labor cost, equipment cost, can also be found. While the rough estimates work as good indicative figures, it’s been observed that most of the times projects tend to overshoot by 25-100% of the original cost estimate. Since construction process can take from 10 months to 2 years, increase in the price of material and labor gets overlooked, affecting your overall budget.